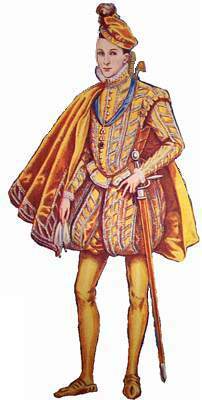 Charles IX of France in a costume that emphasizes yellow. Reproduced in Social England, ed. H.D.Traill. University of Victoria Library. Conventions were also used to indicate different professions: doctors wore scarlet gowns, lawyers wore black, and serving men were dressed in blue coats. Long wigs were used for madwomen, while "moors" wore black velvet masks, long black gloves and leggings, all of which were later replaced by black paint. Henslowe's Diary again provides examples*. That, satiate with spoil, refuseth blood. And jetty [jet-black] feathers, menace death and hell! Item, i little double for boy. Item, i senator's gown, i hood, and 5 senator's capes. Item, i Pig's damask gown. . . i little jacket for Pig.